‘Thomas Gower for 2 mease with two motts and a feylde with a crofte oaulde Colvarfeyldus sumtyme wes called Broughtons Cheswyke that lies bytwyne Cheswyke Greyn and Warings Chessewyke and a grounde of Warings caulda Buxstons. And Thomas Waryng for a meysse and three croftus lyyng togedur in length bytweyn Cheswyke Greyn and a feld cauld Waryngs Cheswyke and in breydth bytwene the mottus of Gowers in Cheswyke called the Cheswyke Mottus and a ground of Gowers called Tymcokus”. The area known as Crewenhale seems to be derived from “Craueshala” and dates from 1190 as mentioned by William Dugdale in his “Antiquities of Warwickshire” . Creynolds Lane being an adaptation of Crewehale. A prominent feature on the map is the moated fortification thought to date from the Saxon period. Very little now remains of mount. In 1953 T. L. Jones of the Ministry of Public Building and Works had excavated on the site which consisted of an irregular area of around an acre. It was surrounded by a bank and water-filled moat. Jones trenched the area immediately within the SW entrance sectioned, the eastern bank in two places, attempted to section the moat and, revealed a small rough area of stone rubble (interpreted as a floor) in the north-eastern angle of the embankment. Gullies and what may have been the traces of timber structures existing before the construction of the embankment were found. Jones concluded that the defences were put up in the fourteenth century or later but offered no credible theories, as to their purpose. 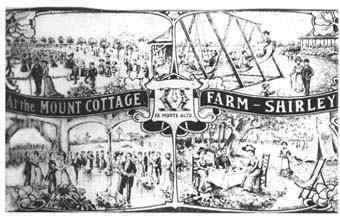 In 1904, some of the land was acquired by Mr Phillip Baker, a Birmingham lawyer, who developed it as Mount Cottage Farm Pleasure Gardens featuring donkey rides, tennis courts and rooms offering refreshments. There was even a ballroom. There was an entrance along a lane that ran alongside the cottage that is now 174 Creynolds Lane, and passing Mount Cottage Farm where the school playing field is now. 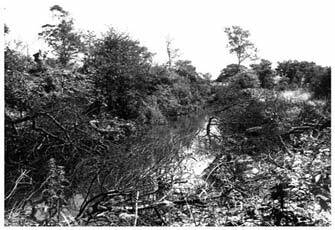 This lane is still visible (photo) from the footpath running from alongside 53 Boscobel Road. Before the bungalow at 194 Cheswick Way was demolished there stood in its back garden a Monument Column (photograph) and a number of stone tablets that was part of the VC Memorial Garden**. The large house opposite known as The Rowels is 193 Creynolds Lane. Note the row of trees running from the Sand Pit to the Mount. These are the fine trees between The Pines and Saxonwood Road at the Junction with Cheswick Way. The formal Gardens and Ballroom stood where Boscobel Road, Longleat Drive and Osbourne Croft now stand. Its interesting to see that the layout of the fields remain mostly unchanged in the past 100 years and how the hedgerows then form the layout of our roads today. Unfortunately the advent of the First World War finally brought to end The Mount’s time as a pleasure resort. After the first World War the land was divided into plots of various sizes between 1/4 and 1 acre. These were sold for £70 mainly to ex-service men wanting to use their gratuities to buy a small piece of land of their own. Many of these people came to use the land to build week-end bungalows where they could enjoy the country, after a week in Birmingham. Others built more substantial dwellings and set up small holdings, and many of these latter remain to this day, happy to spend their declining years in surroundings of green fields and trees. There was a Dog Racetrack just off Creynolds Lane between the entrance to Elliot’s Hall (TSB College) and No 157. Behind that and not visible on the map was Shirley Racecourse on land that is now Shirley Golf Club. The Mount and its water filled moat are still intact. New roads have appeared to service the estate. Pleasaunce Walk being where Cheswick Way is to the point where it joined Appian Way – now the junction with Saxonwood Road. You will notice a lane called Coppice Walk leading to Mount Drive that is now the footpath between Cheswick way by the bus stop to Saxonwood Road that still has the old Laurel bushes along part of its length. Brooklands Walk runs where present day Foxland Close is. The names Coppice Walk and Appian Way made it to the new development of Cheswick Green but in different locations. During the Second World War, many people bombed out of their permanent homes went to live in their week-end bungalows, and due to the post-war housing shortage remained there when hostilities ceased. Many of these people wished to replace their week-end bungalows by more permanent structures, but were unable to get permission to do this from the local authority then controlling the area. This has resulted in a considerable number of substandard dwellings, although there are a few well-built houses. 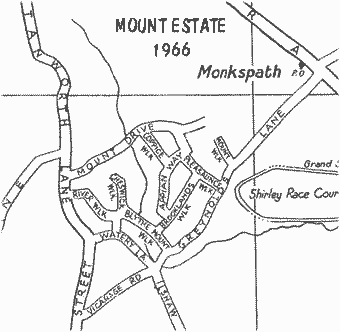 Several attempts have been made to form a residents association which would try to co-ordinate individual attempts to keep the MOUNT tidy, and the roads in repair. 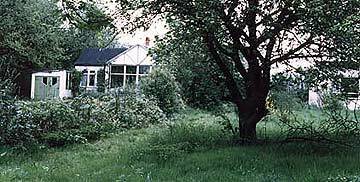 The Greaves’ Organisation has bought each plot from its owners separately. Mrs. Bliss, a former secretary of the local residents association, says the minimum paid was £8000 an acre, plus compensation according to the money householders had spent on their property. “Most of us though, didn’t have that much land so we’re not coming into fortunes”. At the end of the sixties the land was purchased by Greaves Builders. The old Mount Estate properties were bulldozed and a new village built. From the onset the concept was the creation of a traditional English village but with modern amenities. Cheswick Green was planned as a total community, complete with its own village green, shops, pub, assembly hall, playing fields, school and open spaces. House designs ranged from three bedroom terrace houses (modern equivalent of the traditional cottage) to large four bedroom detached houses with full central heating and two car garage, set on large plots. So great was the demand that all the homes offered in Phase 1 were sold out in only 2 days and more had to be released for sale. 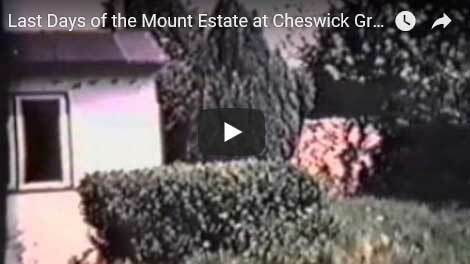 On 19th August 1970 a meeting was held at St Patrick’s School in Earlswood to discuss the establishment of a Residents Association for the new village of Cheswick Green. Some Eighty people from the new houses attended and a committee was formed to draw up the rules and objectives and generally get things moving. Their main aim was to develop the community spirit and as part of that to organise the construction of a Community Hall to be sited opposite the shops and village green. The first Association Cheese & Wine Party was held in October 1970 at Salter Street School and over 100 residents attended. 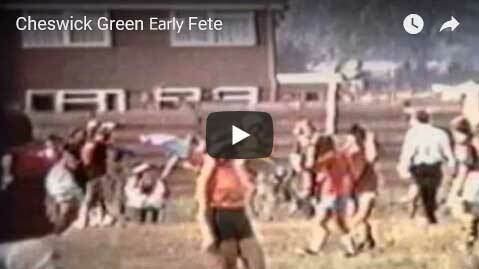 The link to the video clip below shows a light hearted communal football match between men and women that was part of one of the first ever Cheswick Green Fete’s. At this time there was no pub or village hall and of course no new doctors surgery but the shops are visible. During 1972 Greaves applied for planning permission to build more houses on three sites to extend the size of the village. As part of the new development the ancient Mount itself was to be flattened and houses built upon its ‘grave’. Greaves had used the existence of the ‘Saxon Settlement’ in its sales literature and had named roads to perpetuate the historic atmosphere, but were now telling everyone that it was just a useless feature that had served its purpose and should be swept away. 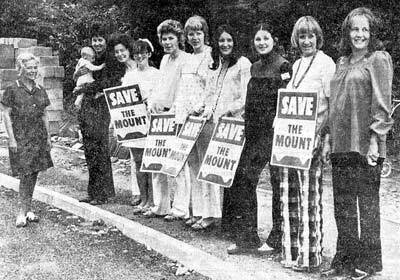 This started a hectic few months during in which residents fought and lost a valiant ‘SAVE THE MOUNT CAMPAIGN’. This followed coverage on both local and national television, press and radio – 750 signatures on a petition – letters to Government Ministers, barricades were built and human chains defied the diggers. The residents managed to achieve a stay of execution for a month whilst Warwick University Archaeology Department conducted a hurried archaeological survey. of the site, which predictably ‘proved’ that there was nothing of interest worth saving. The fight was lost, 60% of the Mount was flattened and houses were built and Huntsmans Point came into being. The Saxon was built after many of the houses constructed during the first phase of Cheswick Green in 1974. 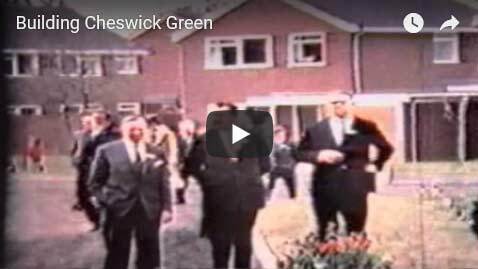 This was the year that Cheswick Green Primary School was built and Cheswick Green and Hockley Heath came back under the control of Solihull, having been under Stratford council for a period of time. There was a great deal of discussion within the community as to the name of the new Pub about to be built adjacent to the shops; bets were laid. Suggestions were, The Mount Inn, The Red Lion, The Pink Panther and from those who believed that the building work would last forever in the village, The Bull Dozer and the leading contender, The White Elephant! The Public House eventually opened to a thirsty village at noon on Wednesday 1st May 1974. The Mayor of Solihull, Councillor Gibbons successfully pulled the first pint and he declared: We all know what American Prohibition did no good whatsoever – Cheers! The pub was named, predictably perhaps, The Saxon and was run by Pete Watson and his wife Doreen, who had moved from The Bulldog in Leamington Spa. They were to remain in the Village for two years, leaving in April 1976. This Solihull Life blog features exhibitions and local history projects that capture, preserve and share aspects of the life of the Borough. There is also a longer-term project – Solihull Remembers – to commemorate individuals from places now in the Borough of Solihull or in the old Solihull Rural District who lost their lives as a result of service in the First World War.